A FINANCIAL ADVISER has said total overcharging in the tracker mortgage scandal is expected to reach €700 million and there are thousands of impacted customers who have not yet been included in redress schemes. Speaking to the Oireachtas Finance Committee today, Padraig Kissane, said the Central Bank’s investigation into the overcharging “brings about more questions every day, some of which remain unanswered for affected customers”. The scandal saw more than 33,000 customers of the country’s banks being overcharged by their lenders when they were either denied a tracker rate they were entitled to, or charged the wrong rate of interest on their mortgage. Kissane brought the issue of overcharging to the Central Bank and the Financial Services Ombudsman a number of years ago and has been advocating on behalf of impacted customers. In a committee meeting last October, he warned the number of impacted customers could be higher than 30,000 – an estimate that was backed up months later by the Central Bank. Today he named a number of lenders that still have “cohorts” of customers not corrected and some who have not even been deemed impacted, though he believes they are. These banks are AIB/EBS, Bank of Ireland, Danske Bank, KBC Bank, Permanent TSB and Ulster Bank. All of the pillar banks have committed to paying back impacted customers and offering them compensation by June this year. However, Kissane told the committee that there could be “at least another 5,000 cases outstanding” as lenders continue to push back on the issue of ambiguous contracts. In many cases, it was not clear in contracts that a customer would not have the right to switch back to their tracker if they moved temporarily to a fixed rate. He said the law here dictates that where there is doubt about the meaning of a term, the interpretation most favourable to the customer should prevail. The financial adviser blamed the scandal on the competition between banks at the time to lend as much as they possibly could. He said there was a “race to the bottom” with interest rates. Kissane also spoke of the impact this overcharging has had on the lives of the customers he is working with. “I’ve had attempted suicides, not explained, but ‘not with us any longer’, health issues,” he told committee members. The tentacles of this octopus spread everywhere. He referenced one woman who sold her house in 2016 because she was afraid of going into debt. She is not included in the figures for people who lost their homes as a result of the scandal. “She was completely broken,” he said. The process – particularly if the customer has to appeal – can be traumatising for many, he said, as they are forced to go back over the stress of that time and to share personal details of their lives with bank officials. Even on a financial level, Kissane pointed out that it can be hard to quantify the cost as families will have cancelled pension or insurance policies that they will have to start up again from the beginning. They empty every single bucket, they run up every credit facility to the max, then they go to friends, parents, other members of the family, then they go into arrears. They will empty every single bucket, families will tighten every single belt they can before they get into arrears. He said the decisions made now by the banks in relation to the other cohorts and to appeals or court actions taken by customers, will give a true indication of how serious they are about changing their culture. Email “Tracker mortgage scandal: Overcharging total expected to reach €700 million”. 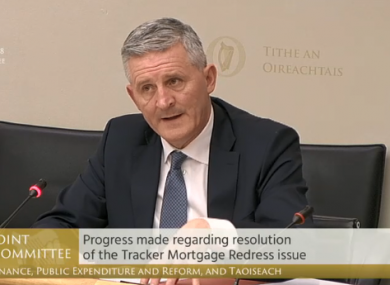 Feedback on “Tracker mortgage scandal: Overcharging total expected to reach €700 million”.